Emotions have definitely been high for me this past month. 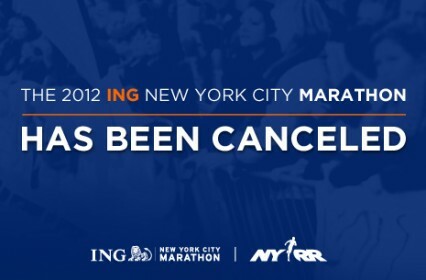 I was nothing short of devastated when the New York Marathon ended up being canceled. I already had my bags packed, my Wonder Woman costume laid out, my watch charged up, and my playlist ready to go. I really trained hard for that race, and I was ready to PR. To have that pulled out from under me on the Friday evening of race weekend was just a big shock. I understand the decision in the face of such a natural disaster, but the whole thing was just handled so poorly and the race should have been canceled much sooner. It ultimately screwed over both everyone that wanted the race to happen and everyone that wanted it canceled. Matt and I ended up going out of town for the weekend just to escape and get my mind off the race. I was a roller coaster of emotions for a few days. On what would have been my marathon morning, I decided I had to run another marathon, if only to not let myself be defeated. I promptly signed up for the Rehoboth Beach Marathon, a small race of under 700 runners that will have almost no spectators and requires runners to carry their own gu/race fuel. I knew what I was signing up for, but I just wanted to run something, ANYTHING. And no other race fit my schedule. Between vacations and half marathons and holidays, I have no other weekend available for a race. Philly was sold out when I made the call, and I also knew I wanted to be there to support Matt as he ran Philly, so I didn’t really want to take away from that and run it myself. I tried to get back into the swing of things with training, and did one week of peak training again, with a 20-mile long run. And after that, I admit I haven’t done much. I was just so mentally prepared to run New York. Stopping to taper and then starting again was just too hard. I was already worn out and tired of running. I’ve taken it easy the past couple weeks, and I will be going into this race in far from optimum condition. I know I won’t PR, and it will be tough. But at this point, I’m running it just for the sake of running another marathon. I am still not sure of what is happening to this year’s NY runners. NYRR has not yet announced how they’re handling the situation. I doubt I’ll get a refund of my $255 race entry fee. And at this point, I don’t even care any more. I assume we’ll get guaranteed entry into the 2013 race, and maybe runners will have their pick of entry over the next few years. Who knows? I don’t expect NYRR to handle anything with respect or consideration of their runners at this point. Even if I do get guaranteed entry for next year, I’m really not sure if I want to run another marathon. I had it in my mind that NY would be it for me this year. And that’s what kept me going. I don’t know if I want to dedicate another chunk of my life to training. I also know Matt isn’t running another marathon. So if I do run it, I’ll be doing the training on my own. It’ll make it much harder to run for four hours on a Saturday or eat well when Matt doesn’t have to do the same thing. I also think the idea of running half marathons instead is just so much more appealing. 13 miles is nothing at this point. I could actually manage to cross train and work on my weight and muscle tone while still running enough to do half marathons. That isn’t the case when I’m training for a marathon. I always gain a few pounds and lose muscle tone in every non-running muscle of my body when I’m training for a marathon. Just because you run a whole lot doesn’t mean you can eat a million calories a day. Your body gets used to it. And you have to eat a lot to sustain that level of activity. I don’t really have to change my diet for 13 miles. And it’s also something I can get better at. Even if I trained for hours a day and worked harder than I ever have, I doubt I’d ever run a sub-4:00 marathon. It’s just a fact. But for shorter distances, like a half, I can realistically work on my speed and see improvements. After Rehoboth, I’ll have run three marathons. That’s three more than most people can say they’ve ever done. I’ve proven a lot to myself, and I’m really proud to be able to say I’ve done it. Maybe I’ll do another one at some point in my life. Maybe I won’t. But I’ve already surprised myself and can put an emphatic check mark on that item of my bucket list. With that rant out of the way, it’s time to get to the really good stuff, this year’s Philadelphia Marathon. The Philly Marathon will forever hold a special place in my heart. It was my first marathon in 2011. And at this year’s race, I got engaged after the finish line. This was my first time spectating at a race. I planned on seeing Matt at four points in the course, and made a separate sign for each point. Leading up to race day, I had a hunch Matt was going to pop the question soon, and thought the marathon would be a good choice. He said one of his friends who was coming to watch the race with me had a connection who worked for the race and was able to get us some passes to a media tent by the finish line so we could get a good spot to see Matt cross the line. Of course I thought it was a little suspicious. But come race morning, I was so genuinely excited for Matt and overwhelmed by the race that I completely forgot about any thoughts of a proposal. Watching everyone along the course reminded me how much I love running, and how much fun I had at this race last year. It was so touching to see so many New York marathoners who had been accepted to the Philly race after they opened extra spots to accommodate the displaced runners. I am proud of how welcoming my city was that morning. It was chilly, but so fun to stand there and cheer everyone on. I also had a lot of friends running both the marathon and the half, with many running their first big races. I was on a runner contact high when Matt was getting ready to cross the finish line. We were able to sneak on to the actual race concourse with our passes, right after the finish. I saw Matt finish and then he went to get his medal while we walked back over to the media tent. He had missed the water and food stops since he came back to the tent with us and asked if we could go in and get some water. 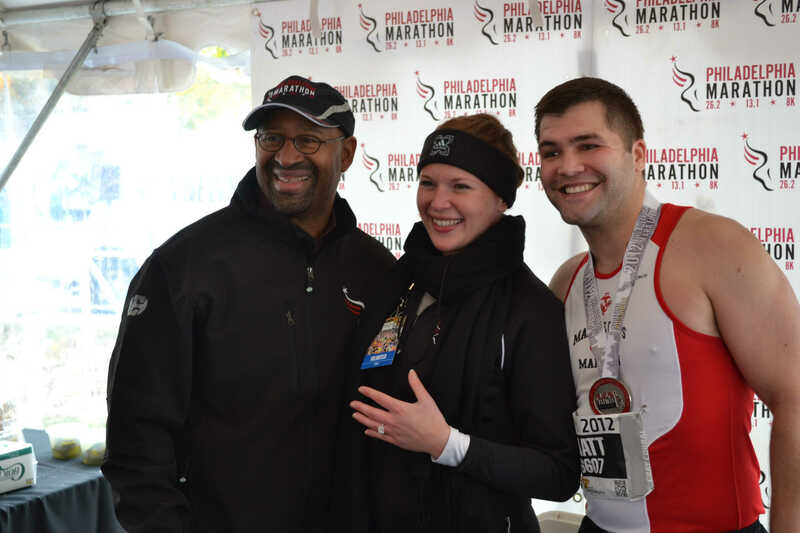 Then he asked to take a picture together since they had a nice Philly Marathon banner in the tent. I started taking off my bags and putting down my posters and didn’t even notice he was standing there with a ring. Of course I said yes. There were many tears. Philadelphia Mayor, Michael Nutter, stopped by to offer his congratulations and offered to officiate the ceremony! We might take him up on that. It was an absolutely amazing experience. Many professional photographers and journalists were on hand recording the whole thing. I also had my best friend there with me, which made it even more special. 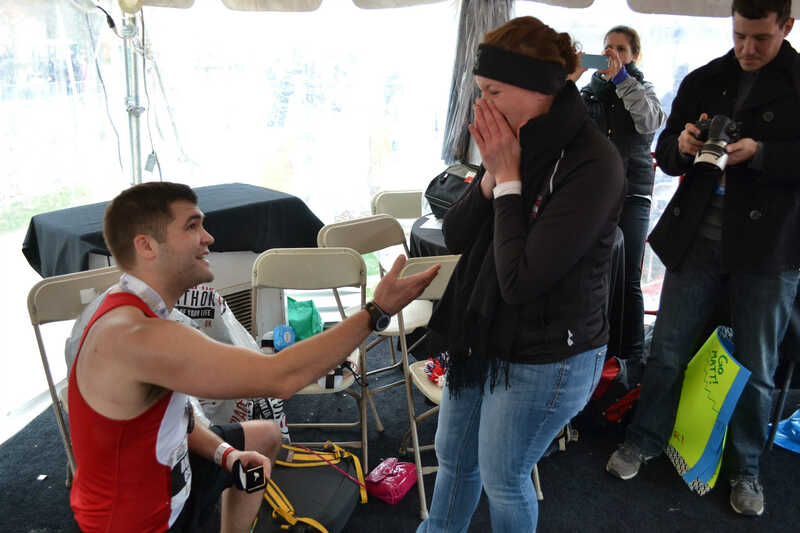 Running has been a huge bond for us, and proposing at a race will forever cement that. The folks at the marathon went above and beyond in helping Matt plan everything. I can’t thank them enough for making the proposal so memorable. After the excitement, we met with a reporter from the South Philly Review, who wrote a story on our engagement, which you can read here. Unfortunately, the article proclaims that a marathon is 26.1 miles (it’s 26.2) and Matt is from Bensalem (he’s actually from Bethlehem). But it’s still a wonderful keepsake to commemorate our special day. This weekend we are headed to Las Vegas to celebrate Matt’s 30th birthday, and also to run the Rock ‘n Roll half marathon, since we can’t go on vacation without doing a race. Recap to follow next week! This entry was posted in Marathon, Running, Training and tagged engagement, Hurricane Sandy, marathon, new york marathon, rehoboth marathon, rock n roll las vegas, running, training by Jackie. Bookmark the permalink.